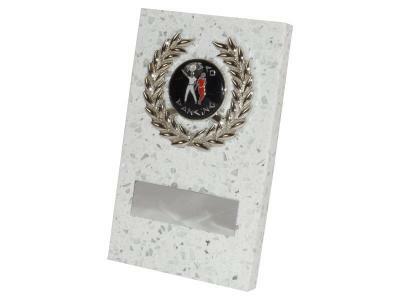 We're a small family team, specialising in the design and manufacturing of natural stone trophies and gifts. 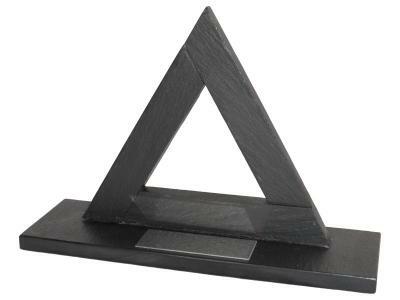 From humble beginnings in 1978 when Paul's father John developed a range of slate trophies in his garage, the business has continued to grow and evolve, but stays steadfastly true to the original ethos of providing distinctive and quality trophies at reasonable prices. With contributions from Paul Maden (Art and Design, Production Manager), Samantha Maden (Sales, Engraving, Production Support) and John Maden (Manufacturing Engineering, Production Support), we have the imagination, the expertise and the capacity to meet your requirements and exceed your expectations. 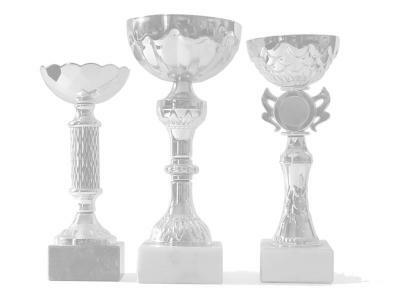 We design custom trophies and awards to celebrate your successes and as keepsakes to remember special occasions. We'd love to talk to you about your weird and wonderful ideas for that special gift or trophy. Our prices are reasonable, and we can progress from your original idea to delivery within a couple of weeks. Below we present a small sample of our more unusual designs. 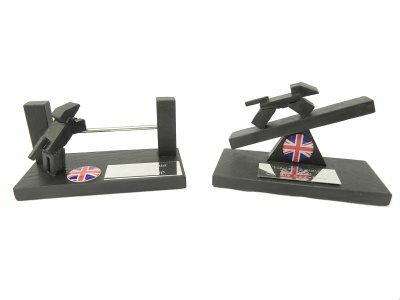 These trophies in black riven slate and stainless steel were designed and constructed to celebrate the winners of Great Harwood Gym's Summer Giants Strongman competition in Towneley Park, Burnley. They stand 9" tall on a 6" x 3" base. 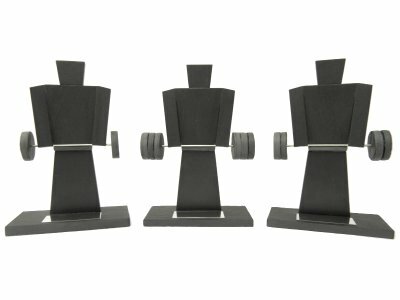 They are now available to order for £41.49 including VAT each, and will be personalised with your quantity of weights (e.g. 3 pairs for 1st place) and engraved with your own message. These bespoke trophies in black riven slate and stainless steel were designed to present to the winners of a large dog agility competition. They stand approximately 2½" and 3" tall respectively on a 5" x 2½" base. They are now available to order for £21.49 including VAT, and will be engraved with your own message and personalised with your logo. Four other designs are available, as are volume discounts, please call to discuss your requirements. 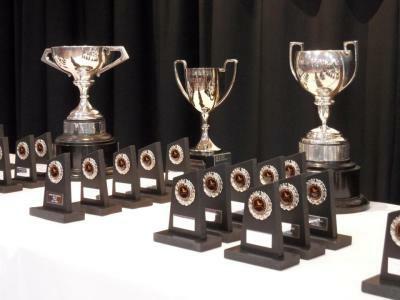 Please note these trophies do take longer than most others to make, and we would ask that you give us two full months' notice prior to your event date. This bespoke trophy in black riven slate was commissioned to award to the winners of a frisbee golf competition at a local college. It stands 7" tall on a 5" x 3" base. It is now available to order for £26.49 including VAT, and will be engraved with your own message and the frisbee personalised with your logo. 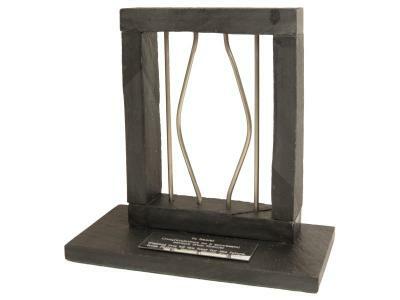 This trophy in black riven slate and stainless steel was created as a leaving present for a highly valued employee. It stands 5¾" tall on a 6" x 3" base. It is now available to order for £31.49 including VAT, and will be engraved with your own message. 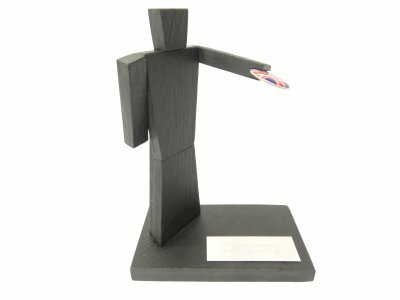 This trophy in black riven slate was created as a humorous gift for one of Paul's friends with a tendency for chipping pool balls off the table. It stands 5¾" tall on a 8½" x 2½" base. It is now available to order for £26.49 including VAT, and will be engraved with your own message. 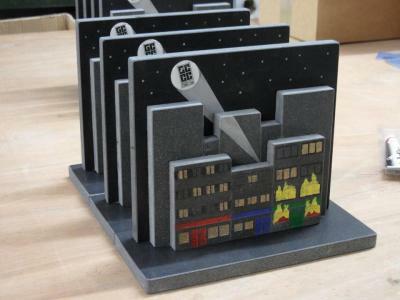 We're always hard at work creating bespoke trophies for a variety of customers. With each new design we make a promise not to spill the beans until after a customer's presentation date, so please stay tuned, more new designs will be appearing soon. 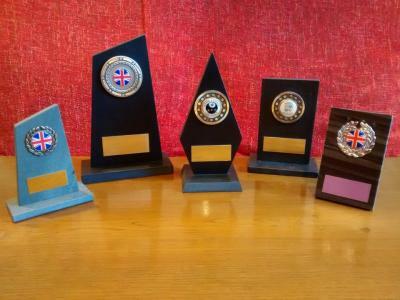 We also produce a wide selection of more conventional trophy designs, available to purchase in a range of sizes and materials. Our earliest designs date back as far as 1978, with new additions and new materials being added to the range to suit changing tastes. A small selection of some of our most popular designs are shown below. Large format trophy for corporate customers. Available in sizes from 6" to 8½" in slate, marble, quartzite and granite. 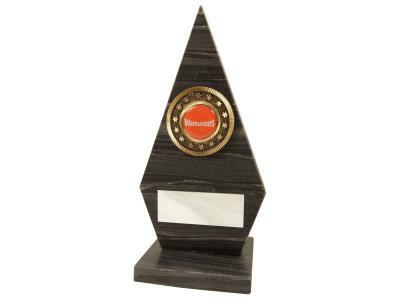 Smaller format trophy, suitable for individual keepsakes. Available in sizes from 3" to 5½" in slate, marble, quartzite, granite and starlight quartz. 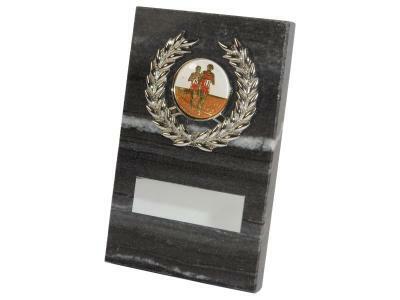 Small to large format trophy for individual keepsakes, prizewinners and corporate customers. Available in sizes from 4½" to 9½" in slate, marble, quartzite, granite and starlight quartz. 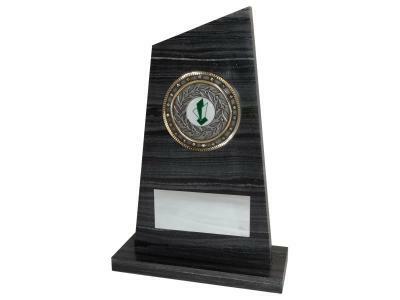 Large format trophy designed for corporate customers. Available in sizes 8", 8¾" and 9½" exclusively in Westmorland Green Slate. We work with many types of natural and man-made stone. Beginning with our original designs in Westmorland Green Slate, we have slowly expanded the range to include black riven slate, brushed finish marble, polished granite, quartzite, basalt (lava) and quartz (an engineered stone composite). We are always on the lookout for new materials. A beautiful mottled green slate, quarried for over 400 years from the heart of the Lake District then honed and polished to a smooth finish. A rough and rugged black slate, retaining a riven finish front and back, sealed and polished to a light sheen. An engineered stone, composed of 93% Quartz and resin, mixed with crushed glass to provide the sparkle. A luxurious black and grey quartzite from nothern India, honed and polished to a smooth finish on the front face. After a 12 month development period, our new laser cutter/engraver is now permanently set up and ready for engraving onto our popular black riven slate. 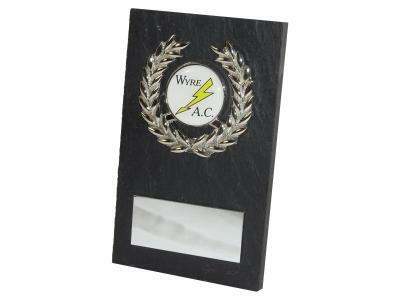 Trophies, clocks, placemats and coasters, plaques and hanging signs can all be personalised to your requirements. We can work with your own supplied artwork if requested, or create your design using one of our many pre-built templates for special occasions such as birthdays, weddings and anniversaries. We also manufacture slate coasters in a range of seasonal designs and can personalise these with your name or message too. Please contact us for more information or to discuss your laser engraving requirements. June 2016: "Ask us about our particle accelerator!" The new UV exposure unit, washout station, compressor and sand-blasting cabinet are now fully operational, enabling us to permanently engrave logos and other designs onto slate, stone and glass. 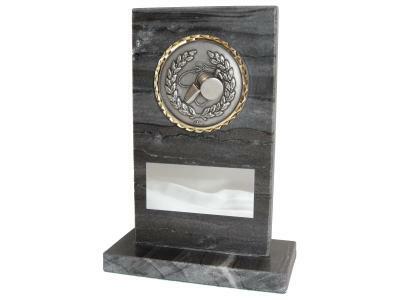 Engraved slate and stone trophies are eye-catching and unique; a permanent record of your achievement actually set in stone; be it granite, basalt (lava) or 450 million year old slate. 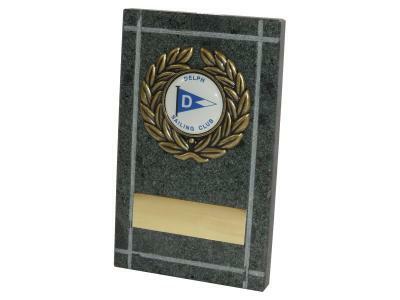 In addition to personalised trophies, we can also engrave house signs, tableware, memorial plaques & stones and much more. Please contact us for more information or to discuss your personalised glass, stone or slate trophy requirements. We operate a design studio in Chorley and a retail shop and workshop in Burnley, and welcome visitors by appointment at either location, given sufficient notice. 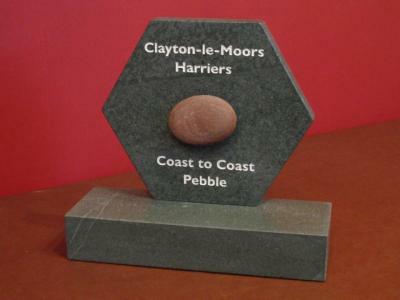 In all cases, please contact us via our shop, Green Slate Trophies, to purchase any of the above products, or to commission your own design. We'll never put you under any pressure, and may just surprise you with the perfect something for your presentation. We're open from 10:30am to 6:00pm, Monday to Friday. Please note our new later opening times from September 2018.